During American Craft Beer Week in May of 2009, I set out to taste a different local beer (local to me: VA/DC/MD) each day for that week, and to document the exercise. For beer #5, I had two pints at Capitol City Brewing Company, a Shirlington, Virginia, brewpub: an organic Saison and a cask-conditioned Nut Brown Ale. I'm no photographer, and —to paraphrase a long-ago advert— I don't even play one on TV, but my photograph from that day —of the bartender pulling the pint of Nut Brown— has become the cover artwork for the just-released May 2010 issue (Volume 31, No. 2) of All About Beer magazine. 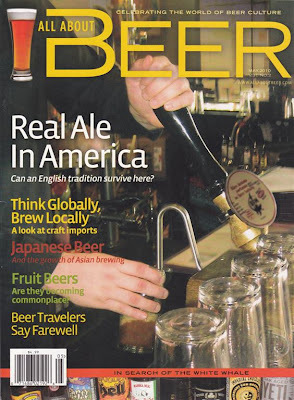 The feature story is by Steve Hamburg: "Real Ale in America: Can an English tradition survive here?" It's a brief primer and worth a read: commending the growth of cask-conditioned ale in the US, indicting sloppy techniques. For this shot, I used a Canon PowerShot SD400. I've since 'upgraded' to a Canon Power Shot SD980IS. What label did they place on the handle? Brasserie des Franches-Montanges (BFM), a Swiss brewery. An interesting choice, as the article is about the survival of an "English tradition" in the US.